What To Do If Your Insurance Doesn't Cover Wheelchairs Or Crutches : Shots - Health News Your health insurance plan might not cover items such as wheelchairs, walkers, crutches, boots and braces. The cost is small compared with many medical bills, but adds up if you pay out-of-pocket. Under the Affordable Care Act, many insurance plans are required to cover a range of essential services, such as hospitalization and prescription drugs. But reimbursement for certain medical equipment — such as crutches or a leg boot after an injury — varies widely from plan to plan. One July evening a few years ago, Carol Harnett was in a crosswalk in downtown Portland, Ore., when a driver made an illegal turn and hit her. Transported by ambulance to a hospital, Harnett, who is president of the nonprofit Council for Disability Awareness, was diagnosed with a severely sprained right ankle and left wrist, as well as a concussion. "But I can't walk," Harnett recalls saying. With a third-degree sprain, the ligaments in her right ankle were completely torn and she couldn't bear weight on it. "They said, 'If you broke a bone, we could give you a wheelchair, but you didn't — so, we don't think your insurance will cover it,' " she recalls. Instead, after she signed a waiver agreeing to pay whatever her insurance didn't cover, they gave her a pair of crutches to use while in Portland to give a speech. 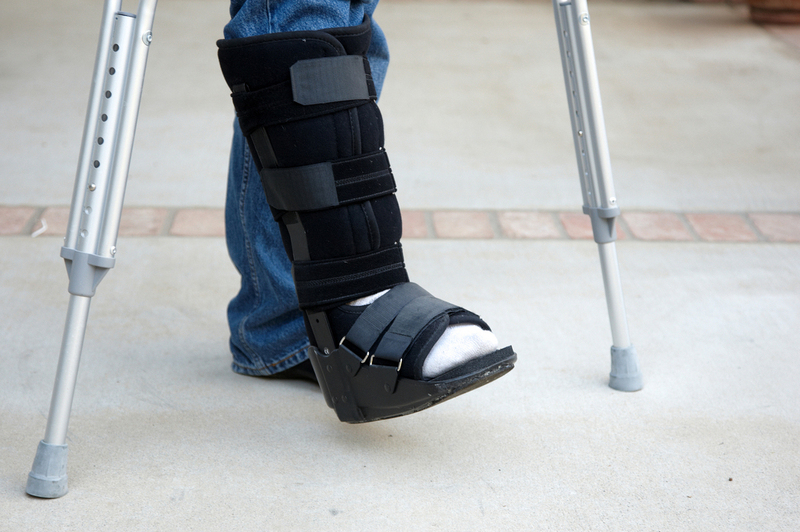 Unless you've already had need of such equipment, chances are you have no idea how your insurance policy would cover the wheelchair, walker or knee brace you might require if you had a car accident or got hurt on the ballfield or tripped on the stairs. The cost for "durable medical equipment," as these devices are called, may be small compared with the bills for emergency or specialist medical care. But if you're paying for such equipment out-of-pocket, the costs can add up — it's worth your time to look into your coverage and figure out how to get the best deal. Harnett's 2015 accident was later determined to be work-related, and the workers' compensation program paid for her care. If that hadn't been the case, she would have been on the hook for the crutches, because her own insurance plan didn't cover any durable medical equipment that could be purchased over the counter. It would have covered the reinforced braces for her wrist and ankle, but only after she met her deductible. "Historically, [durable medical equipment] has always been a weak point in coverage," says Harnett, who is familiar with these insurance issues because of her disability work. A typical employer-based health plan covers 80 percent of the cost after the deductible is met, according to Harnett. But some consumers may not get that benefit. "We're seeing more skinny plans with no durable medical equipment coverage at all," says Thomas Ryan, president and CEO of the American Association for Homecare, an advocacy organization for home care equipment manufacturers and providers. Under the Affordable Care Act, many insurance plans are required to cover a range of essential services, such as hospitalization and prescription drugs. But durable medical equipment isn't among them — except for breast pumps, which most plans must cover. These days, insurers often contract with certain medical supply companies to provide equipment, just as they negotiate rates for other services. But patients often don't realize that, says Alice Bell, a physical therapist and senior payment specialist at the American Physical Therapy Association, a professional group. Patients who don't use an insurer's preferred provider may be charged a higher rate or have to pay the entire amount out-of-pocket, she says. "It's important to make sure the supplier is in-network, even if the doctor prescribes it, because it varies," Bell says. When Bruce Lee, 48, sprained a ligament in his left leg, his doctor prescribed a walking boot and gave him a list of medical suppliers. The doctor warned Lee to make sure he chose one in his insurance network. Wanda Wickizer didn't know what to think when her 23-year-old daughter got a $40 bill from a medical supply company for a wrist brace she received at an urgent care center after falling down some stairs at a friend's house in Norfolk, Va. Still, "it boggled my mind that they were allowed to bill her, because she never saw anyone from there," Wickizer says. Whatever the arrangement, the key for the patient is to find out whether whoever is supplying the equipment is in their insurance network and how much they'll owe out-of-pocket. You have to ask. Insurers might approve coverage of medical equipment only if a provider certifies it's medically necessary. Even with a doctor's OK, approval isn't assured. The "fancier" a piece of equipment is, the more challenging it is to get an insurer to agree that it's medically necessary, says Dr. Angela Gardner, who practices in Dallas and is a past president of the American College of Emergency Physicians. "In general, for a commercial [insurer], basic crutches will be covered, forearm crutches are partially covered, and hands-free crutches won't be covered," she says, referring to a crutch that attaches to the injured leg and allows someone to move around without relying on their hands or arms. Yet for some patients, shopping around for such equipment is not an option. They need it on the spot or, like Harnett, are unable to get around well enough to go somewhere to buy it. If the patient can wait, many medical device suppliers deliver equipment to the home, or the devices can be purchased online. Sometimes this proves significantly cheaper than using an insurance plan. A pair of standard armpit crutches, for example, may cost $40 at the local pharmacy, while the insurance copayment might be $100. "A savvy consumer will look at the copay and see whether or not they need to use their insurance," Gardner says. Sometimes the prices insurers agree to pay for durable medical equipment are significantly higher than the price online or at the drugstore. That differential can be important if someone has a high-deductible plan and has to pay the entire amount. An orthopedist suggested that Barbara Barrall, of Medford, N.J., replace her simple knee brace with a hinged model she could bend. When the bill arrived, Barrall's daughter, Cynthia B. Sosnowski, thought the $1,400 charge must be a mistake. She went online and found the identical brace for between $79 and $99 at sporting goods and medical supply stores. But when she called the orthopedist's office, the woman said there was no mistake. That was the amount the doctor was allowed to charge the insurer. When Sosnowski called the insurer, she was told not to worry: Her mother's share of the charge was $145; the rest was covered by her mom's employer-based plan for retirees. Sosnowski wasn't placated. "This is why insurance is so expensive in our country," she says. She's since filed a grievance with the insurer to protest the charge. Kaiser Health News, a nonprofit news service, is an editorially independent program of the Kaiser Family Foundation, which is not affiliated with Kaiser Permanente.